TOWER SITE CALENDAR 2007 - SELLING OUT FAST!!! *Almost two months after his retirement celebration began, MASSACHUSETTS radio icon Gary LaPierre received two more honors last week from the station he called home for a remarkable 44 years. 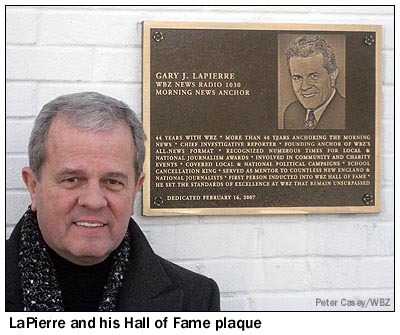 WBZ (1030) inaugurated the "WBZ Radio Hall of Fame" Friday morning, inducting LaPierre as its first member in a ceremony that included the unveiling of a bronze plaque mounted on the front wall of the station's Allston studios - and leaving the veteran morning host uncharacteristically speechless. 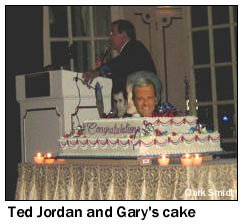 By the way, that is indeed a cake in the shape of Gary's head, below, and it's decorated with cutouts of Gary at various ages, which were also distributed to the guests at the party. 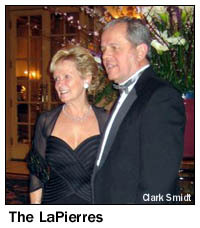 LaPierre and wife Peg appear to be thoroughly enjoying their retirement, with Peg reporting that Gary's having no problem sleeping in after all those early mornings. And be sure to check out wbz1030.com to see production ace Mike Coleman's video tribute to Gary, complete with some priceless clips of old TV campaigns for WBZ. He calls it a "birthday card" to radio, but the Chronicle episode that WCVB's Art Donahue shot, wrote and produced, and which airs Friday night, is really more like a love letter to our medium. Art's spent almost two months working on the half-hour show, and it's truly a work of art, featuring interviews with everyone from Dale Dorman to Arnie "Woo-Woo" Ginsburg to Gary LaPierre to Sophie Zembruski, who's been doing the polka show on WATR (1320 Waterbury CT) since 1934. The show also features some of our favorite station owners, including WATD's Ed Perry and WDEV's Ken Squier, plus some rare bits of radio history from New Hampshire's Ed Brouder, Boston's Donna Halper, WTIC's Jeff Hugabone and, yes, your editor's in there with that august group, too. It's beautifully shot in HD, as the stills below demonstrate, and it's a must-see for anyone interested in New England radio. See for yourself Friday night (Feb. 23) at 7:30 on Boston's WCVB (Channel 5) - and if you're not in range of Boston TV, find yourself a friend in the Hub with a VCR or DVR to record it for you. It's that good. *In other news from around the Bay State, it's just over a week until moving day for CBS Radio's WZLX (100.7 Boston), which is leaving the Prudential Tower after 13 years on the 24th floor for new digs in the former WSBK (Channel 38) building in Brighton, already home to sister stations WODS (103.3) and WBCN (104.1). 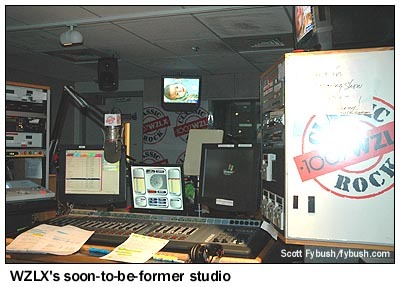 When WZLX moves on March 2, it will leave the Pru with no radio studios for the first time since the early seventies, when CBS moved WEEI (590) and WEEI-FM (103.3) into the building. 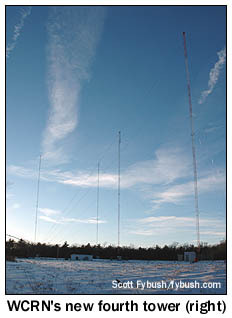 Over the years, the Pru has also been home to studios for WBCN and WVBF/WKLB/WROR, and of course its rooftop tower remains an important FM transmitter site. More remarkably, WZLX's move will leave Boston's Back Bay with no commercial radio stations for the first time since the thirties; just as New York's radio stations have decamped from midtown Manhattan for the cheaper rents downtown and in New Jersey, Dorchester and Brighton have now become the hotbeds of broadcast activity in the Hub. Radio People on the Move: Ron Bowen is inbound from South Carolina's WCOO to be the new operations manager at WXRV (92.5 Andover); his AAA credentials include the sign-on of WRNR in Annapolis, Maryland back in the early nineties. Julia Clarke is departing WUMB (91.9 Boston), where she's been music director and morning co-host, for a new job in music promotion with Songlines, Ltd. Boston Radio Watch reports John "Hutch" Hutchinson, last heard as WBCN's local host of the ill-fated David Lee Roth morning show, has resurfaced on Sunday afternoons at WZLX. Mark Calandrello is inbound to WBMX (98.5 Boston) as promotion director; he filled the same role at WPBZ in West Palm Beach. And Entercom GM Julie Kahn is a newlywed; the Globe reports she's gotten hitched to Boston Magazine president Dan Scully. 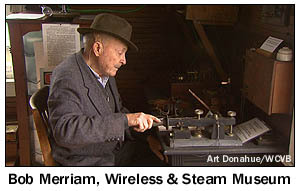 WFCR (88.5 Amherst) has signed on a new translator. W242AT (96.3 Williamstown) extends the public radio station's coverage into the northwesternmost corner of Massachusetts, joining a nearby translator on 101.1 in North Adams, and WFCR says it's working to get three more Berkshire County translators on the air in the near future. And on our way out of Boston over the weekend, we stopped in Leicester to see the new fourth tower at WCRN (830 Worcester), which is now testing its new 50 kW night signal. As WCRN gets the new night pattern tuned up, it's being heard everywhere from Sweden to Michigan at the moment. *An old RHODE ISLAND callsign is returning to the airwaves, as the construction permit for 1370 in Charlestown applies for the calls WKFD. Those calls were on 1370 in nearby Wickford from the sixties until that station went dark in the late nineties, and they'll now return to the frequency, albeit with somewhat less coverage of southern Rhode Island than the old Wickford facility had. *We'll start our NEW YORK report this week in Albany, where EMF Broadcasting is putting both of its national religious networks on the air at once with a two-station LMA (eventually to become a purchase) from Ed Levine's Galaxy Broadcasting. As of Friday, rocker "The Bone" is gone - and its simulcast signals have been replaced by contemporary Christian "K-Love" (on WBOE 94.5 Ravena) and Christian rock "Air One" (on WOOB 93.7 Scotia). Galaxy had struggled to find a foothold in the Albany market, where its pair of class A signals was up against much bigger clusters owned by Clear Channel, Regent and Pamal/Albany Broadcasting. It's in a stronger position in its remaining markets, Utica and Syracuse, where Levine will now focus all his resources. As for EMF, the Albany purchases extend an upstate "K-Love" foothold that already includes signals in Rochester, Utica and Plattsburgh. Given the network's explosive growth in the last few years, we're pretty sure it's not done buying yet. In the Hudson Valley, Bob Dunphy exits as VP/market manager of the local Clear Channel cluster, heading to Dallas, where he'll serve as senior VP/station operations for First Broadcasting. No replacement's been named yet in Poughkeepsie. Way out west in the Southern Tier, where the Pembrook Pines group has put its newest signal on the air. WQRW (93.5 Wellsville) signed on a few days ago as "Q-93.5," with a satellite-delivered rhythmic AC format. It's a sister station to WZKZ (101.9 Alfred). Nexstar's WROC-TV (Channel 8) in Rochester has been looking for a news director for a few months now, and suddenly it's got a vacancy down the hall in the general manager's office, as Marc Jaromin departs after just over a year in that role. Jaromin's predecessor, Tim Busch, returns from his Nexstar corporate post to serve as interim GM for WROC, which also manages Sinclair's WUHF (Channel 31). Entercom is shuffling the program lineup at its two upstate progressive talkers. In Buffalo, the Leslie Marshall show on WWKB (1520) is history after a year of "local" broadcasting from southern California. In her place is a live clearance of Ed Schultz (noon-3), followed by a live clearance of Randi Rhodes (3-6, with the first hour repeated from 6-7), then a Stephanie Miller rebroadcast at 7 and Lionel at 10. In Utica, Fred Miller and Gene Conti move from Clear Channel's "Sports Stars" (WUTQ/WRNY/WADR/WIXT) to Regent's WIBX (950), where they take over as hosts of the 6-8 PM "Sportswatch" show. 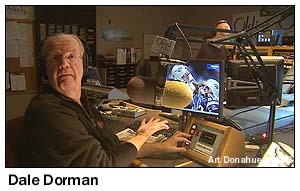 Former hosts Dave Richards and news director George Tharalson remain with the station. Up in the North Country, we've neglected to note the grant of a construction permit to WICY (1490 Malone) to move to 1500. The one-channel move will allow WICY to boost its daytime power from 1 kW to 50 kW, with the tradeoff of becoming a daytime-only signal, albeit one that blasts across the border into Montreal. In New York, WEPN (1050) has hired Mike Missanelli, former WIP Philadelphia sports talker, to serve as co-host of Stephen A. Smith's midday show. And WEPN hired Andrew Marchand away from the New York Post to serve as managing editor, a new position at the ESPN Radio outlet. Univision's WZAA (92.7 Garden City) is apparently changing its calls to WQBU, for its new "Que Buena" regional Mexican format, but somehow the call change was filed at the FCC for sister station WCAA (105.9 Newark NJ); we expect that to be straightened out soon enough. Out on Long Island's East End, we're hearing that WPKM (88.7 Montauk), which relays WPKN (89.5 Bridgeport CT), has been off the air with equipment problems for several weeks. And on TV, a big loss in the New York news community: WNBC (Channel 4) reporter/anchor Ralph Penza died Friday morning at 74. Penza's long career included stops at WABC-TV, WCBS-TV and Philadelphia's WCAU-TV. 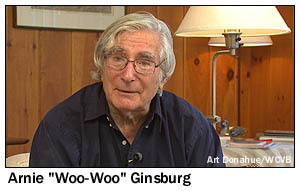 He had been at WNBC since 1980, with a brief hiatus in 1996-97. *In PENNSYLVANIA, the FCC's on its way to town to hear what the public (or at least a small self-selected segment thereof) has to say about ownership consolidation and localism. FCC commissioners will be in Harrisburg on Friday for a hearing at the Whitaker Center for Science and the Arts, the third in a series of such events to be held around the country. The session will begin with a panel discussion (with panelists yet to be announced) at 9:30 AM, followed by a public hearing scheduled to start at 11 and end at 2:30, with a short break for lunch. 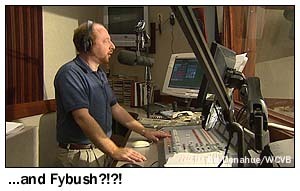 Is an FM talk future getting closer at Pittsburgh's WRKZ (93.7)? "K-Rock" middayer/promotions director Megan Slater is exiting, with no replacement named yet. In Philadelphia, the brief but well-remembered run of modern rock on WDRE (103.9 Jenkintown, previously WIBF and today black gospel WPPZ) will be saluted Wednesday night from 8-11 on WXPN (88.5)'s "Y-Rock on XPN" programming block. Y-Rock PD Jim McGuinn was WDRE's PD back in the day, and he'll host a reunion of former DRE jocks to mark the 10th anniversary of the station's end. Former WHAT (1340 Philadelphia) talk host Mary Mason is moving to WWDB (860 Philadelphia), for a leased-time show on Saturdays from noon to 2. On the TV side, WNEP (Channel 16) in Scranton will need a new news director along with its new ownership. Dennis Fisher is leaving the station after four years, moving to the ND chair of Harrisburg's WHTM (Channel 27) to replace Keith Blaisdell. *There's a new general manager at Press' NEW JERSEY coastal cluster ("Breeze" WWZY/WBHX, "G-Rock" WHTG-FM/WBBO, WKMK and WHTG), as Wes Matejka arrives from Entercom Memphis, where he was director of sales. *In MAINE, WHQO (107.9 Skowhegan) applies for new calls WFMX, last used in North Carolina, to better match its "Mix" identity. There's a new format coming to the FM dial in central Maine, as Light of Life Ministries prepares to shuffle formats on its cluster of religious stations. On March 2, the "God's Country" Christian country format now heard on WMDR (1340 Augusta) will move to WMDR-FM (88.9 Oakland) and its translators in Portland, Freeport and Bangor, displacing the "Zap" Christian rock format now heard there. There's no word yet on what will show up as a new format on 1340. *The AM dial is getting ever quieter in CANADA's Maritime provinces. It's already empty in Prince Edward Island, and soon you may be able to count Nova Scotia's remaining AM signals on the toes of one foot. Halifax was one of the earliest cities in which the CBC moved its Radio One service from AM to FM, silencing CBH (860) in favor of CBHA (90.5) way back in 1989. Now Sydney, the principal city on Cape Breton Island, will soon lose CBI (1140). The CBC has applied to move CBI to FM, on 97.1, with 100 kW DA/123 m. If the move is granted, and once the various other AM-to-FM moves that the CRTC has approved (including CHER 950 Sydney) are carried out, Sydney will be left with only CJCB (1270) on AM, keeping company with remaining Nova Scotia AM signals CJCH (920 Halifax), CKDH (900 Amherst), CKAD (1350 Middleton), CKDY (1420 Digby) and CFAB (1450 Windsor) - and CFAB has applied for a move to FM, too. The CBI application is only one of a pile of Sydney applications that the CRTC will consider at an April 16 hearing in Membertou, NS. Barry Maxwell Martin applied for 103.5 (26.5 kW/170 m) for a rock station, Newcap applied for 101.9 (100 kW DA/123 m) for a classic rock station, Andrew Newman applied for 93.1 (50 kW/86 m) for an AC station, and HFX Broadcasting applied for 100.9 (23.4 kW DA/168 m) for a "youth contemporary" station. More applications to be considered at the April CRTC hearing: Newcap wants a new classic hits station in Kentville, NS, with 30 kW DA/251 m on 89.3. Coastal Community Radio Cooperative wants a new community station in Glace Bay, NS, with 6 kW DA/48 m on 89.7. In Leamington, Ontario, Blackburn Radio applies for a new country station on 92.7, with 4 kW DA/144.5 m. Across the province in Hawkesbury, Ontario, Ottawa Media Inc. wants a "new easy listening" signal on 107.7, with 875 watts/137 m. Up in Carbonear, Newfoundland, Newcap is re-applying to move CHVO (560) to FM, too, with 30 kW DA/124 m on 103.9. There's one more proposed AM-to-FM move in the Maritimes this week: Astral Media wants to take low-power relay station CJCJ-2 (990 Plaster Rock NB) over to the FM dial, shutting off the "inefficient, worn-out" 40-watt AM transmitter and replacing it with a new signal on 91.7 with 50 watts/25 meters. CJCJ-2 relays CIKX (93.5 Grand Falls), and would continue to do so on FM. And we're sorry to report the death of Jim Paulson, who'd been a fixture on CHWO (740 Toronto) since 1991, and for years before that on CING, CHFI, Oshawa's CKQT and CKEY, not to mention his early days in Winnipeg and his native Edmonton. He was also well known as a commercial announcer and as the announcer for motor racing events in southern Ontario. Paulson collapsed while on an AM740 remote on Tuesday and died shortly thereafter from a brain aneurysm. He was 67. Curt Gowdy, the legendary voice of the Red Sox who later became a network sportscaster and station owner (at Lawrence's WCCM/WCGY and several stations in Wyoming), died early this morning at his home in Florida. Gowdy was 86. Boston's sports radio giant, Entercom's WEEI (850), is about to reach even more of MASSACHUSETTS, now that Entercom is paying $5.75 million to acquire WBEC-FM (105.5), the class A FM signal that Vox is moving from its longtime home in Pittsfield to Easthampton, where it will transmit from Mount Tom with a signal reaching from Springfield north into most of the Pioneer Valley. The move will extend WEEI's reach one more market to the west, joining the mothership in Boston, Worcester's WVEI (1440) and WEEI-FM (103.7 Westerly RI), which covers all of Rhode Island and big chunks of eastern Connecticut and southeastern Massachusetts. The largest radio group in northwestern PENNSYLVANIA is getting a new owner, as NextMedia prepares to sell its cluster of signals in Erie to Connoisseur Media. This is the second version of Jeff Warshaw's Connoisseur group, which had holdings in Youngstown, Ohio, among other places, before selling to Cumulus in 2000. Among the stations Warshaw owned in Youngstown was WHOT (101.1), one of the stations founded by legendary broadcaster Myron Jones - and among the stations Warshaw will get with the $17.35 million purchase of the NextMedia Erie properties is WJET (1400), which was once Jones' flagship property. The cluster also includes sports talker WFNN (1330 Erie), country WUSE (93.9 Fairview), oldies WFGO (94.7 Erie), classic rock WRKT (100.9 North East) and top 40 WRTS (103.7 Erie). NextMedia partner Rick Rambaldo, whose history with the stations goes back two decades to his purchase of then-WHYP-FM and creation of "Rocket 101," says he hopes to remain with the cluster as station manager after the sale closes. One of NEW YORK's biggest AM stations will soon be on the move again, for the second time in just over three decades, thanks to a planned golf course that would claim its transmitter site in the New Jersey Meadowlands. WOR (710) has been at its Valley Brook Avenue site in Lyndhurst, N.J. only since 1968, when it moved out of its prior location in Carteret, where it had been since the early thirties. Within a few months, though, WOR will have to tear down these three towers and its transmitter building, thanks to a "notice to vacate" issued by the New Jersey Meadowlands Commission. EnCAP Golf Holdings will end up with the current WOR transmitter site, but it will have to pay for WOR's relocation. It won't be a long move this time; the new WOR site will be just 700 meters northeast from the current site, on a swampy spit of land along Fish Creek within sight of Exit 16W of the New Jersey Turnpike. To make it work, WOR has applied to the FCC to maintain its current 50 kW day and night, with a slightly different pattern that throws deeper nulls to the northwest and southwest, but otherwise leaves WOR's coverage essentially unchanged. The new pattern will come from three 204-meter towers. We'll keep you updated on the first move of a New York 50-kilowatter in decades as it progresses; stay tuned! Up in VERMONT, Vox is engineering another big allocations move that would put a new signal into Burlington. WWOD (104.3 Hartford) would see its 104.3C3 allocation moved way across the state - and indeed, across Lake Champlain - to Keeseville, N.Y., where it would put a decent signal into Burlington. The all-important local service to Hartford would be provided by WSSH (95.3 White River Junction), which would see its 95.3A allocation changed to Hartford, with a power boost to 6 kW. CANADA's broadcast regulators are trying again to put some new radio stations on the air in Toronto. The CRTC reissued its call for applications this week, noting that 101.3 (the channel currently used by multicultural CHIN to relay its 1540 AM signal to the eastern parts of the city) is one potential frequency for a new station or stations in Canada's biggest city. The CRTC also cleared up its Montreal call for applications, specifying that the call is for new AM operations, presumably on the 600, 850, 1410 and 1570 frequencies now sitting vacant. *It's here! As seen in the St. Paul Pioneer Press, the Chicago Sun-Times, and soon on WCVB's "Chronicle," Tower Site Calendar 2007 is not only now shipping - it's close to a sellout! If you're waiting for the 2007 edition to go on clearance sale, don't keep waiting - the word from the shipping department is that fewer than 200 copies remain, and we expect to sell them all in the next month or two.